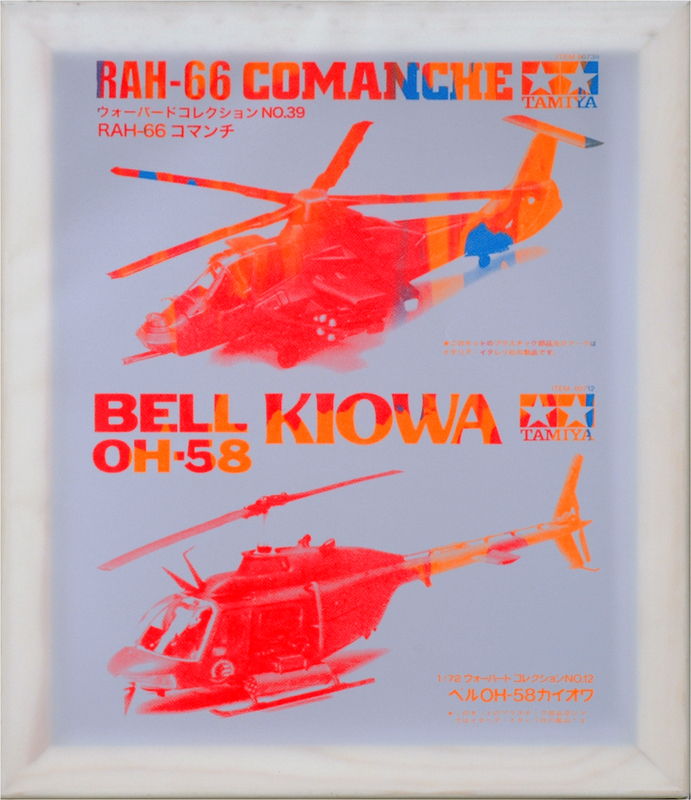 Comanche Kiowa, Jason Lujan, 2014, serigraphy on mylar stretchers. Alan Altamirano, the printmaker from Oaxaca, and I visited IPCNY, International Center for the Prints, NY. It can be hard to find the first time you look for it. If you walk the High Line in the Chelsea gallery district you might spot the signage in their 5th floor windows on the south side of 26th St. Enter 508 W. 26th St and you can ride an old gated elevator with a human operator up to the gallery. There is always something interesting there. 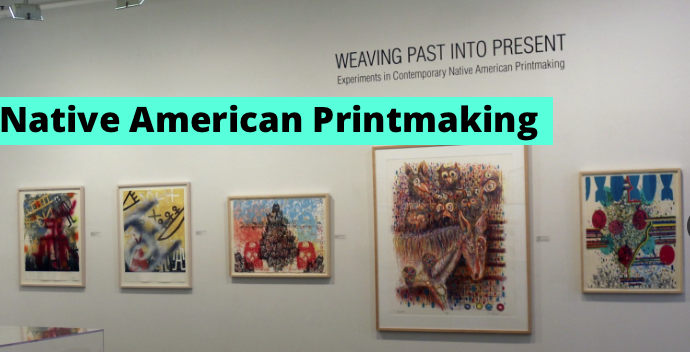 One of the two current exhibitions is “Weaving Past into Present: Experiments in Contemporary Native American Printmaking.” There are over 40 works by artists who identify as Native Americans: Mohawk, Seneca, Navajo, Flathead/Salish, Chiricahua Apache, Cree, and more. The work pictured above is food for thought. 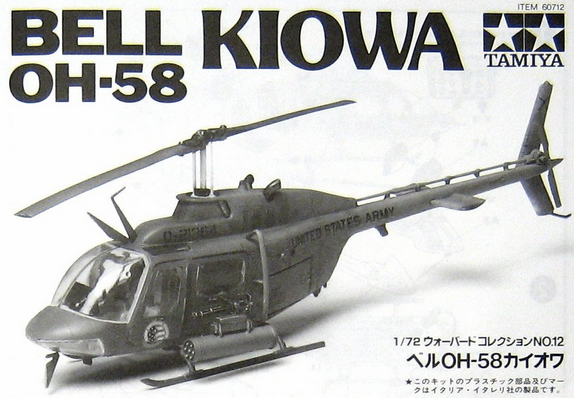 Perhaps the naming of military helicopters was meant to pay the Kiowa and Comanche warriors a compliment. Seems Jason Lujan sampled the graphic images directly from the instruction sheets for Tamiya plastic model kits. Earlier in the day I seen a room chuck full of Andy Warhol’s Campell soup cans at MOMA. I had forgotten his Cream of Asparagus. 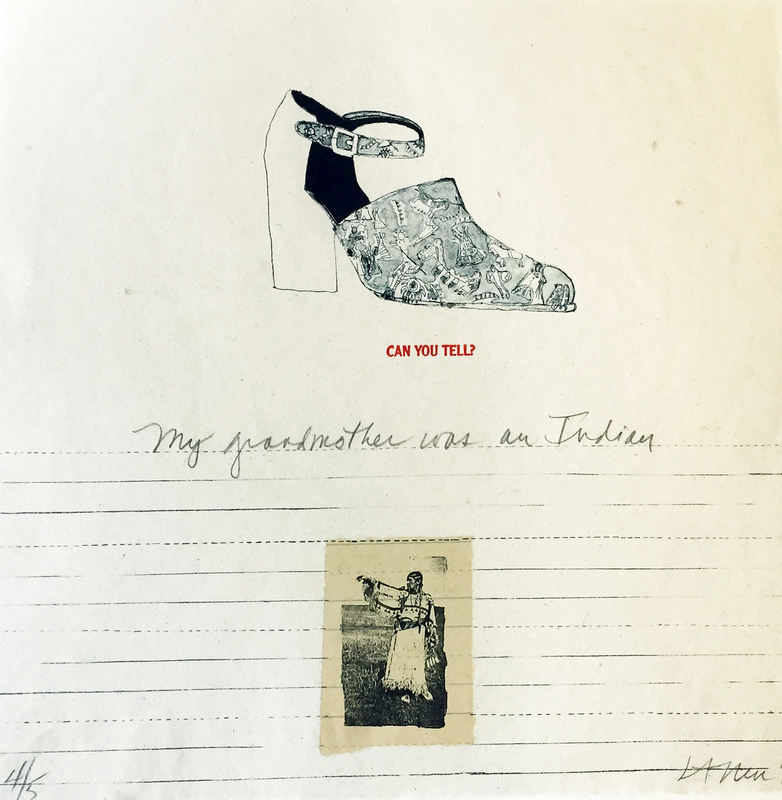 Warhol and Lujan remind us that appropriation is a given in the fine art world. 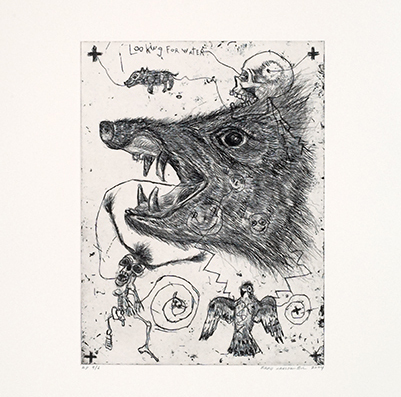 I especially liked the expressionistic etchings by Brad Kahlhamer. They seem quite original and energetic. For me they evoke animal totems, handmade maps, and sketchbook art. Henry David Thoreau Cabin 2012 by Alan Michelson. Handmade paper over balsa wood. My friend Alan Altamirano was most impressed by Alan Michelson‘s meticulously constructed paper houses. 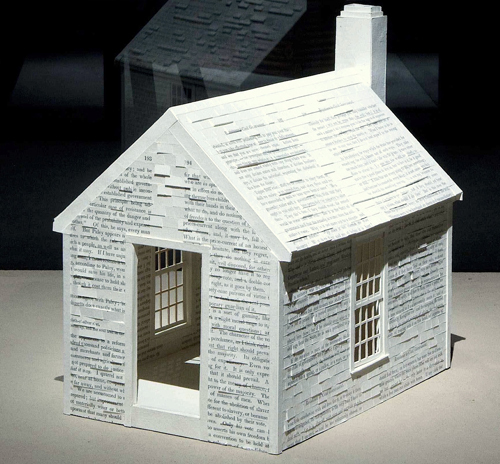 Altamirano is quick to admit he can’t read English, but he appreciated the tonal effect of the text and he presumed that the writing was a personal reflection on the concept of home. He noted that had seen prints transformed into three dimensions before, but these he found particularly well done. There are over 40 works in the exhibition in a wide range of styles. The show runs until Nov.10 and then might travel. All of the prints can be seen on the ICPNY website. There is also a contextual essay by the curator, Sarah Diver, explaining some of the specific events in U.S. history referenced by these works. ICPNY’s website is worth a visit for its up-to-date list of NYC galleries specializing in prints. ICPNY is a nonprofit organization dedicated to the print, so they are not in competition with commercial fine art galleries. If you ask the staff will gladly point you in the direction of other worthwhile print exhibitions in the neighborhood. We would not have know about the Shepard Fairy show at the Pace Prints if we hadn’t asked. < Previous Orale! Alan Altamirano esta en Kutztown.